Accompanying text to a plate from Richard Bridgens' 'West India Scenery.' The plate depicts enslaved men, women and children clearing the land and planting sugar cane on an estate on the island of Trinidad in the early 19th century. Growing sugar cane was a very long and arduous process. 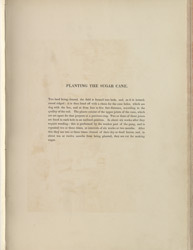 After the land had been divided and holes created using small hoes, the canes were planted at intervals of four to six feet. This work was done by the first field gang, which was a group of the strongest and healthiest male and female slaves. Every six weeks the fields would be weeded, and this would have been done by groups of weaker slaves. After 12 months the canes were harvested.